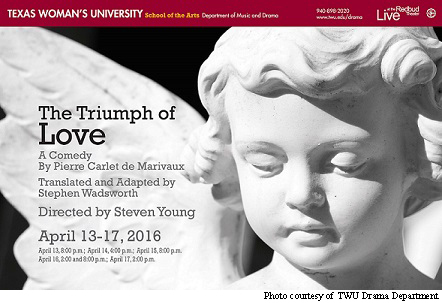 TWU’s Drama department is holding open auditions for “The Triumph of Love,” a play by Pierre Carlet de Chamblain de Marivaux and adapted by Stephen Wadsworth. Auditions are being held today from 4:30-6:30 p.m. in the Redbud Theatre with open callbacks tomorrow from 4:30-7:30 p.m. The play will be directed by associate Drama professor Steven Young. Students who wish to audition will be asked to fill out an audition form, which will be provided, and should bring a resume and headshot as well as prepare a one-minute monologue and a joke. Excerpts from “The Triumph of Love” can be used if students are unable to find another monologue. The 18th-century play follows a princess who disguises herself as a man. The play is a comedic examination of gender roles and norms of the time in which it was written. “The Triumph of Love” will be performed April 13-17.